I had a lot of good reaction to my recent post about handwritten notes. I thought I would expand that a bit to the good old-fashioned letter. 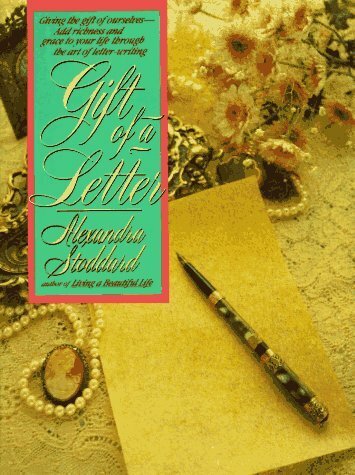 Alexandra Stoddard wrote a book in 1991, that continues to be recommended and read titled, Gift Of A Letter. I have had this book for several years and have re-read it once or twice. It’s an excellent look at the lost art of letter writing. There aren’t a lot of books that look at letter writing from a modern-day cultural perspective and Alexandra Stoddard does a good job of suggesting ways of bringing us back to a simpler, and more personal time. Interestingly, Stoddard is most often thought of as a “writer for women” but I found the book (as is often the case) gender neutral. It’s all about marketing. This enchanting book is dedicated to one of the most intimate and touching of human experiences — the letter. With charm, grace, and enthusiasm, Alexandra Stoddard describes the art and the pleasure of writing letters and the surprising joy it can bring to writer and recipient alike. A letter that takes only a few minutes to write may be treasured for years. Its contents are a true expression of heart, mind, and spirit. Brimming with anecdotes and ways to bring letters into your life, Gift of a Letter inspires and satisfies. I can highly recommend this book as a good addition to your library if you have an interest in all things paper. Note that you can pick this book up used at Amazon Marketplace for as little as a penny plus $3.49 shipping. So, this book can be delivered to your door for three and a half bucks. You can’t go wrong.